IDX Broker has been selected as one of OUTSIDE’s Best Places to Work 2017. Each year, OUTSIDE recognizes the top 100 companies in the United States that help their employees strike the ideal balance between work and play. We know that happy, healthy employees are our most important asset; which is why we promote an active work/life balance. 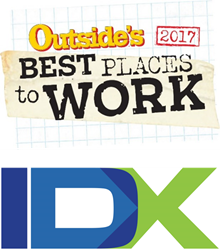 IDX Broker announced today their selection as one of OUTSIDE’s Best Places to Work 2017. Each year, OUTSIDE recognizes the top 100 companies in the United States that help their employees strike the ideal balance between work and play. Not only are the winning companies recognized as great workplaces for employees, but they respect the environment and encourage enjoying life in the great outdoors. IDX Broker, a leading provider of Software as a Service (SaaS) tools for real estate websites, prides itself on fostering a culture which stimulates both professional and personal growth. Their 60 employees are encouraged to join bowling, kickball, and soccer leagues and often host events at the company-owned “arcade bar” three blocks from the office. The winning companies are those that value productivity in combination with an active, eco-conscious lifestyle, for a fulfilling experience inside and outside the office. This is OUTSIDE’s tenth year providing the Best Places to Work and IDX Broker’s third consecutive award. For more information on OUTSIDE’s Best Places to Work 2017 or to schedule an interview with an editor, please contact Kailey McGarvey at kailey(at)rosengrouppr(dot)com or 646.695.7046. Based in Eugene, Ore., IDX, LLC is nationally known as a leading provider of real estate search applications. IDX, LLC actively manages more than $2 trillion worth of active listing data from more than 660 individual Multiple Listings Services (MLS). IDX, LLC provides integrated IDX software, customizable listing search utilities and lead management tools for real estate based websites. In addition to the primary web-based software, IDX also provides an integrated WordPress widget for use in WordPress based blogs and websites (IMPress for IDX Broker WordPress Plugin), as well as HTML Mobile Optimized Pages for all mobile devices. The entire suite of real estate software available from IDX is easy to manage and maintain and helps real estate professionals display real estate data from their MLS regardless of their technical ability. For more information on all the services provided by IDX, LLC, please visit http://www.idxbroker.com.